Here is a recipe that is wheat free, gluten free, low carb, high protein and low GI and still tastes amazing! 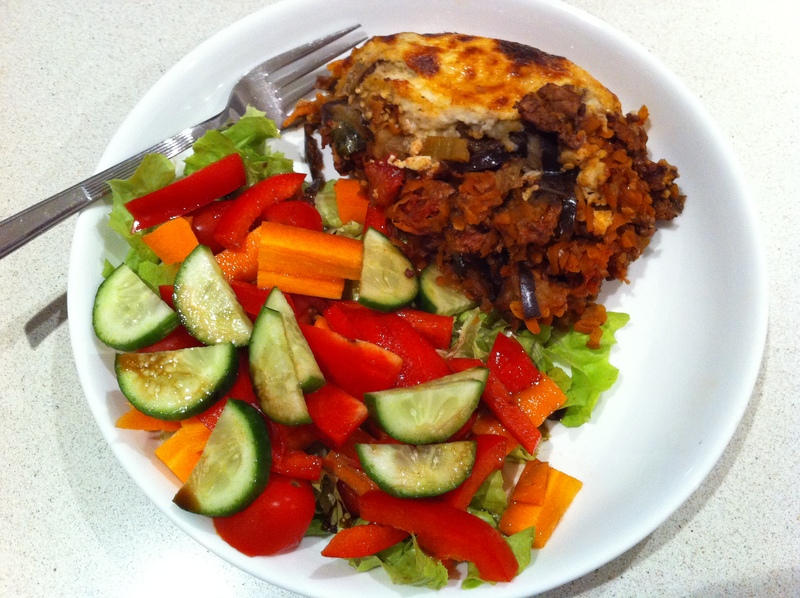 Though the recipe I took it from calls it a lasagna it is really a moussaka as it uses layers of eggplant instead of lasagna pasta sheets, making it ultra healthy. I have always been skeptical about moussaka’s as I had a very bland one a couple of months ago at The Union Hotel as noted in one of my older posts, however this one is far from bland. The nutmeg in the white sauce adds a nice touch, and overall the white sauce is much tastier than the usual flour based white sauce, and best of all gluten free. If you give this recipe a go, let me know what you think! Remove the lid and cook for another 10 minutes until the sauce becomes rich and meaty, season with freshly ground black pepper. Place the low fat ricotta or cottage cheese, nutmeg and egg white in a food processor and blend until smooth and creamy. splash of water until soft and cooked through. chopped parsley and season with freshly ground black pepper.